Eyelash extension, not something that is new but yet, not really common. There are no friends around me who do eyelash extension, and I wonder why. There are so many sayings about eyelash extension, some scare it will hurt during the process, some say own eyelash will drop off etc etc, but mostly, just remain neutral bout eyelash extension. 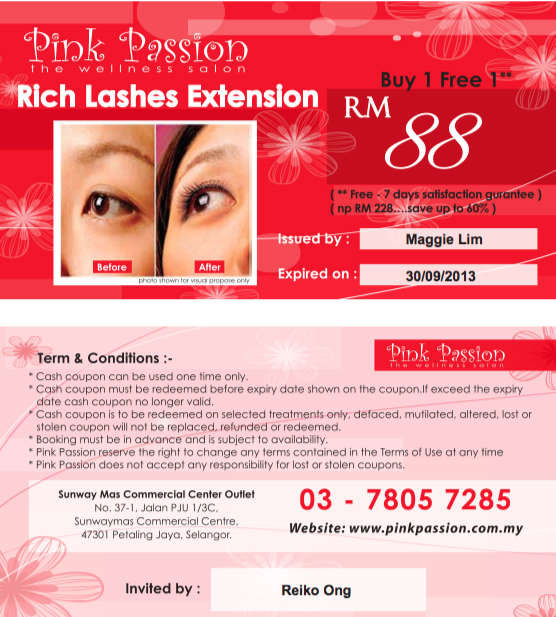 Given an opportunity by Pink Passion, they sponsored me for their Rich Eyelash Extension service. This is my frist time try the service, honestly, I'm just as nervous as everybody else. I'm worried bout the process whether it hurts or not, I'm worried bout the outcome, the after effect etc etc. But seriously, never try, never know! So brave up myself, and head to my first appointment of eyelash extension. Located at Sunway Mas Commercial Centre, it is not hard to locate the shop as it is the ONLY shop painted in pink! It is such a busy area that Pink Passion's customer come and go, nonstop. Usually their appointments are full for the whole day, so be sure you make an appointment with them before you walk in. Honestly, I never thought of myself doing eyelash extension hahaha. 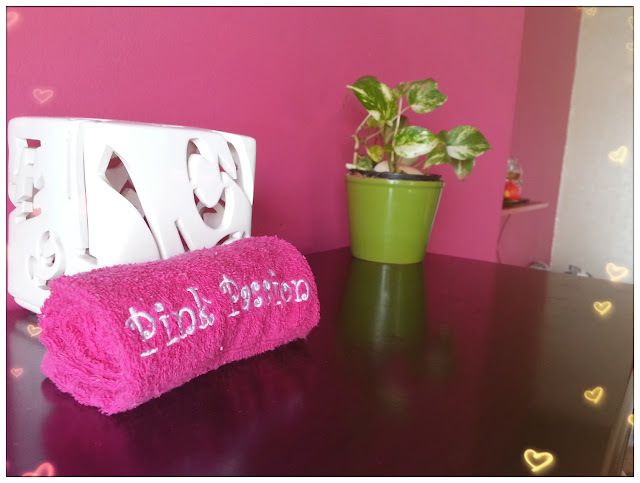 When I walk into Pink Passion, immediately I feel relaxed and stress-free, the place is so calm and serene that it feels like I've walk into a totally different world. With light music playing as background, dim lightings and friendly staffs, I'm pretty sure that I'm gonna get some awesome services here. Maggie, the owner of Pink Passion wellness salon, is an elegant and understanding lady who runs the business 6 - 7 years ago. They are one of the pioneer in the eyelash extension industry and they provide eyelash extensions education to those who wanna do eyelash extension services. 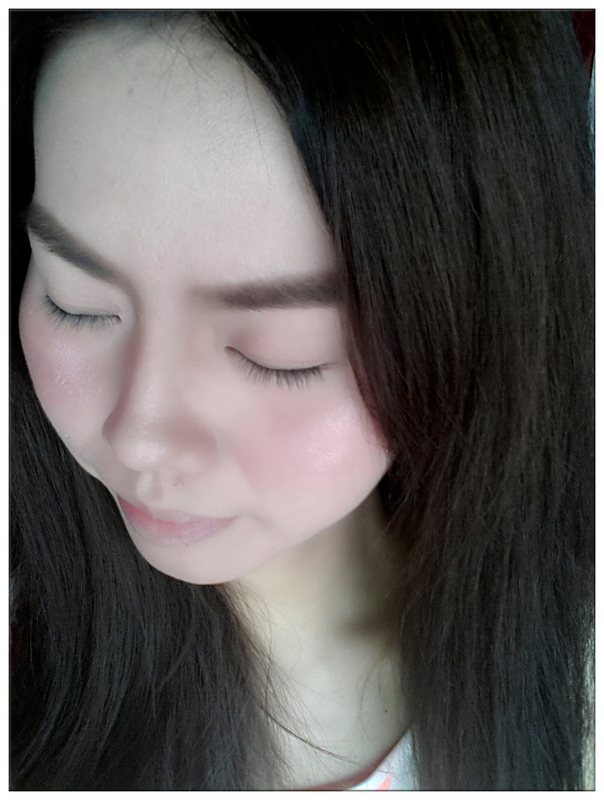 One of the well-known supplier for eyelash extensions products too. Pink, green and wood colour match, reminds me of flowers and nature. Just wanna take a nap on the bed. lol. There's fear in people when they don't know how the real progress is. As for eyelash extension, it takes about an hour to complete the whole process and voila, butterfly wings-like long lashes is there to say for about a month. Pink Passion uses high quality imported eyelashes and eyelash glue from Korea, so the lashes are more light-weighted compare to others and the glue will stay longer as well, making the eyelash extensions stayed longer than others do. There's no whatsoever painful feeling during the process. Basically, the staff will stick a plaster at your lower eye area, and will start sticking the lashes one by one. Sometimes you will feel a bit ticklish, but most of the time just plain nothing. It was a relaxing process and I almost fell asleep during the eyelash glueing process and while waiting for the glue to dry. When open up my eyes after, can't really get used to it because it's just like sticking fake eyelashes on your eyelids but this time, there's no taking it off. haha. But after some time, they feel just as natural as your own lashes, you won't even feel a thing! 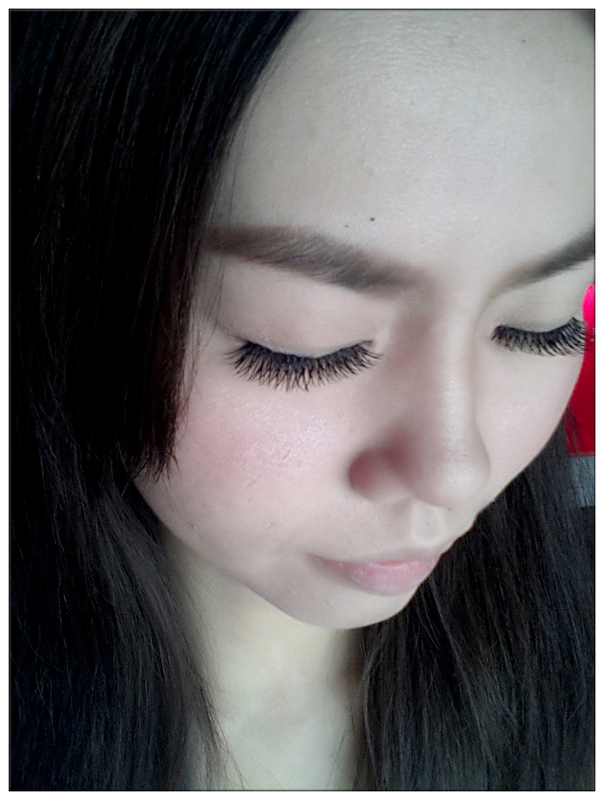 Rich eyelash extensions, gives a semi-dramatic look, eyes look more energetic even without any make-up on! Ms. Maggie is kind enough to give my blog readers and friends a special price for their Rich Lashes Extension service. When the normal price is RM168, now my blog readers and friends can enjoy this awesome service at just RM88! Do remember to book your slot for an appointment and you'll be amazed by how your looks changed in just an hour! 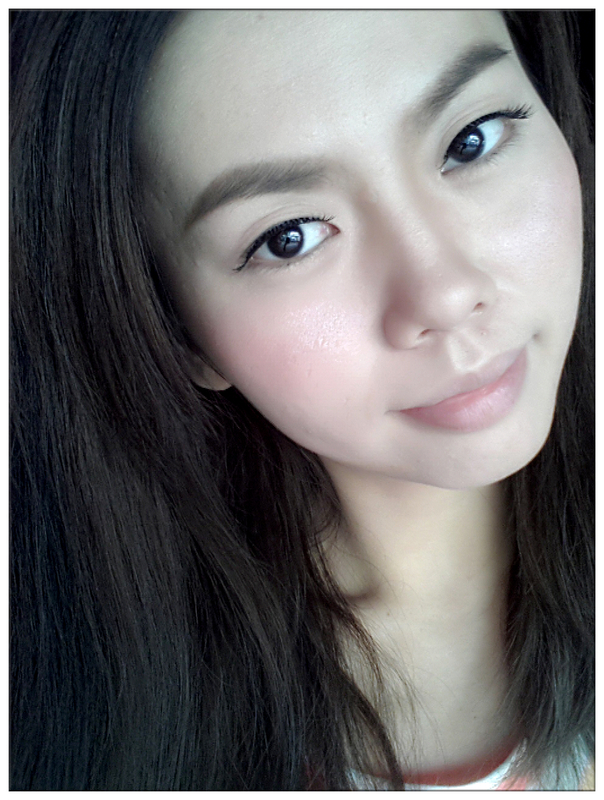 As some of you knew that I just came back from Krabi, the eyelash extension has made such a big difference on my appearance that my eyes look magnetic even without make-up on. The eyelash sticks so well to my eyelid eventhough I've been through the days with hot sun and sea water, went sea-swimming and snorkeling, the eyelashes still in a good shape! Thank you Pink Passion for the wonderful service and it has changed my perception towards eyelash extension, and now I'm not sure whether I can live without it or not. lol.